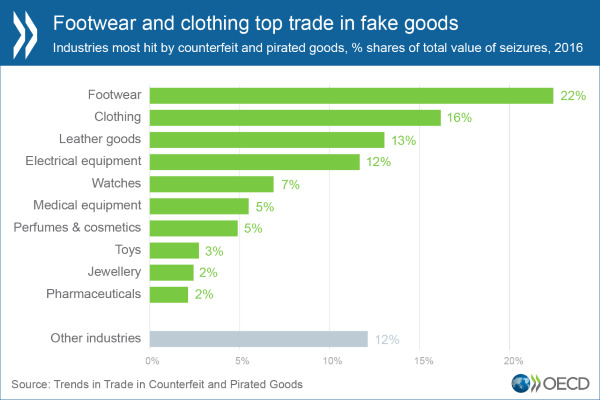 The trade in counterfeit and pirated goods now accounts for 3.3 per cent of world trade and is rising fast, according to a report published today. The total value of the illicit trade – based on 2014-2016 customs seizure data – is a colossal $509bn, which represents a 10 per cent increase over the $461m estimate published three years ago based on 2011-2013 seizures and is an “alarming” increase, according to the Organisation for Economic Co-operation and Development (OECD). Zeroing in on the EU figures the picture is even more stark, with counterfeit goods accounting for up to 6.8 per cent of imports from this countries, according to the report, which was co-produced by the OECD and the EU Intellection Property Office (EUIPO). That is equivalent to a market value of $134bn, and represents an increase from 5 per cent of imports in 2013. Importantly, the top-level amount doesn’t include domestically produced and consumed counterfeit and pirated products, or pirated digital products being distributed via the Internet, and comes against a backdrop of a slowdown in the global economy. “Trade in fake goods, which infringe on trademarks and copyright, creates profits for organised crime gangs at the expense of companies and governments,” says the OECD. “Fakes of items like medical supplies, car parts, toys, food and cosmetics brands and electrical goods carry a range of health and safety risks,” it continues noting that examples include ineffective prescription drugs, unsafe dental filling materials, fire hazards from poorly wired electronic goods and sub-standard chemicals in lipsticks and baby formula. The report notes that counterfeit and pirated products continue to follow complex trading routes, often passing through transit economies that host large free trade zones. Footwear and clothing together accounted for more than a third of all customs seizures in 2016, with leather goods and electrical equipment also prominent when it came to the proportion of total seizures by value (see table below). Customs also uncovered an increase in counterfeits of goods less commonly seen in the past such as branded guitars and construction materials, says the OECD. 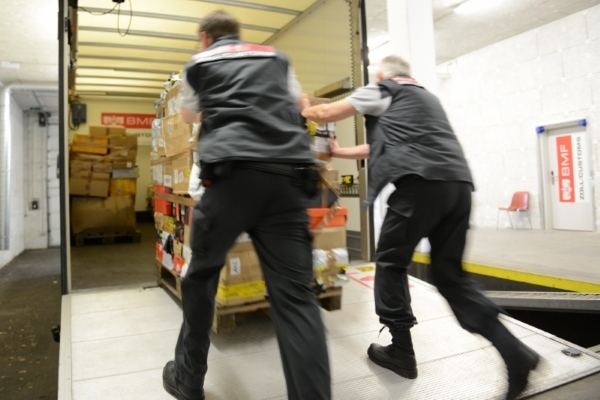 Once again, the report pointed to a big increase in the use of small parcels sent by post or express courier as a growing distribution channel for counterfeits, accounting for more than two-thirds (69 per cent) of total customs seizures by volume over 2014-2016 (57 per cent via post and 12 per cent via courier), up from 63 per cent over the 2011-2013 period. “Past OECD-EUIPO analysis has shown that free trade zones – where economic activity is driven by reduced taxes, customs controls and lighter regulation – can unintentionally facilitate counterfeit trade,” it adds. The OECD is working with its member countries on formal guidelines to help authorities stem the problem. And while counterfeit and pirated goods originate from virtually all economies in all continents, China and Hong Kong continue to be by far the biggest source, with the United Arab Emirates, Turkey, Singapore, Thailand, India and Malaysia also prominent contributors to the trade. The countries most affected by counterfeiting in 2016 were headed by the US, whose brands or patents were concerned by 24 per cent of the fake products seized, followed by France at 17 per cent, Italy (15 per cent), Switzerland (11 per cent) and Germany (9 per cent). Emerging economies aren’t immune however, and a growing number of businesses in Singapore, Hong Kong, Brazil and China are also becoming targets.